All Sensors Pressure Points are application tips to simplify designing with microelectromechanical (MEMS) pressure sensors and avoiding common pitfalls. 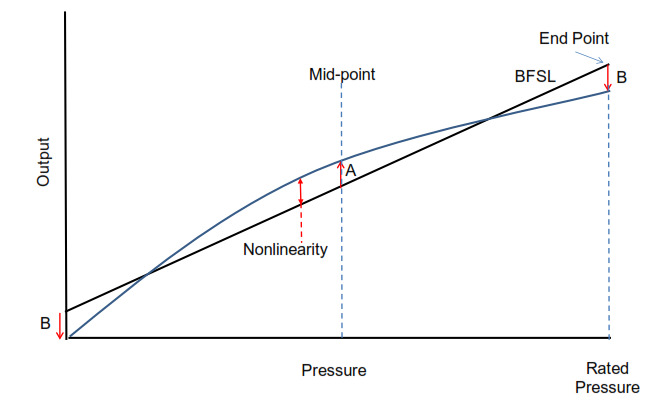 Pressure non-linearity is one of the parameters that impacts sensor accuracy. (For other factors, refer to All Sensors Pressure Point 2: Understanding Accuracy and Precision for MEMS Pressure Sensors.) As such, users need to understand some of the nuances involved with measuring and specifying linearity. Factors that impact piezoresistive pressure sensor linearity are the topology and placement of the piezoresistive elements, diaphragm thickness, and construction elements. Generally, temperature has little effect on linearity except in highly sensitive applications. As a result, sensor manufacturers only test for linearity at ambient temperature. The main linearity issue is how the results are computed and reported. The following identifies common test methods and specification techniques for determining the linearity of MEMS pressure sensors and other sensors, as well as a lesser known linearity situation that specifically impacts MEMS pressure sensors. The most straightforward nonlinearity specification is the end-point method. 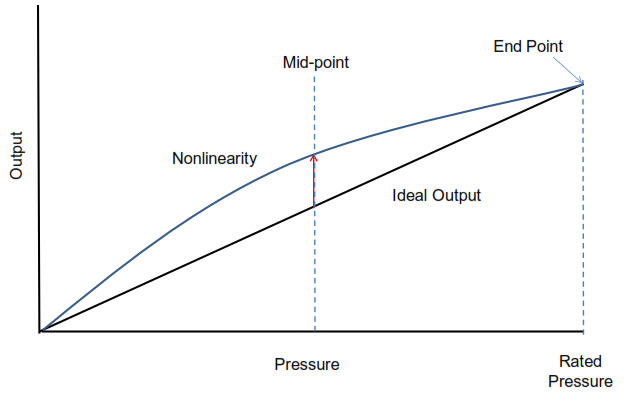 As shown in Figure 1, it starts with the line from the output at zero pressure and extends to the output at rated pressure. The nonlinearity is the maximum deviation from the end-point straight line (Equation1). Typically, this value is expressed in percent of full scale span (%FSS). Note: at the rated pressure, a particular sensor’s output can be above or below the nominal output. Figure 1. 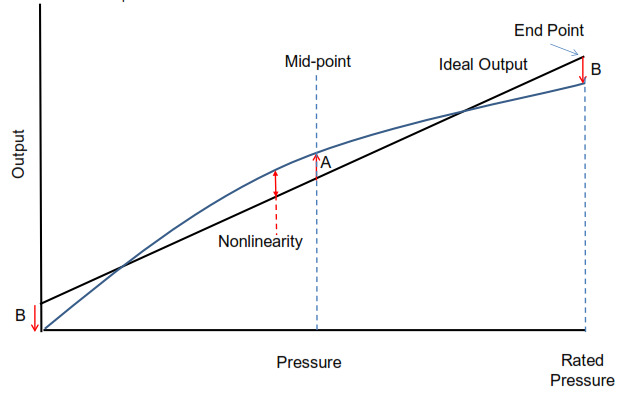 End-point nonlinearity is easy to observe in a sensor with a simple output curve. Figure 2. The best-fit straight line minimizes the variation for the actual output. Figure 3. The least squares fit method is the method of determining the sum of the least squares. Suppliers typically only test for linearity on the top or front side of the sensor. However, in some cases, both front and back side pressure are specified. Users need to be aware of the difference between the readings. If the supplier tests one side and the customer uses the opposite side, the performance can be quite different. In addition to sensitivity, the linearity can be directly impacted as well. In a harsh environment, applying pressure to the backside of the sensor is a common solution for improved media compatibility. As long as the fluid or media is compatible with materials on the backside of the sensor, a more rugged application results. As noted previously, users need to be aware of the performance impact of applying pressure to the backside. Front-to-back linearity (LinFB) compares the gain (expressed as span) on the front side to the gain on the backside of a pressure sensor. Equation 3 shows the calculation for LinFB. For differential applications that need both positive and negative pressure applied to the sensor, LinFB can be an important performance factor. If the front-to-back linearity is acceptable, users do not need to perform a separate calibration for positive and negative pressures. This can cut test time dramatically. Front-to-back linearity can have as much as a 7 to 8% difference if the sensor manufacturer has not taken it into account in the sensor design. With a CoBeam2™ design technique that targets improved front-to-back linearity, a LinFB of 0.3 to 0.5% can be achieved. For many users, this is sufficient to eliminate any concerns for front-to-back linearity. In fact, for the CoBeam2, the front side linearity is more closely matched to the backside linearity as well. Previously, the front side could achieve 0.5% linearity while the back side was as high as 3% or more. CoBeam2 technology enables both sides to achieve better than 0.3% linearity for both front side and back side linearity. Since CoBeam2 provides a substantial improvement to both of these parameters, it simplifies the user’s calibration and performance specifications. From front-to-back, both the linearity and the gain are more closely matched than designs that are not optimized for these parameters. This dramatically reduces these two error components. Pressure sensor suppliers typically have a single method that they use for all products or have sufficient confidence in their test procedure to use the one method to guarantee meeting other specifications. Depending on the product line and requirements, especially of large volume customers, a supplier can change its method of specifying linearity. For custom orders, a supplier may use a completely different method. Typically, the discussed test methods provide the basis for linearity specifications. In addition to standard linearity measurements, for MEMS pressure sensors, users need to be aware of front-to-backside linearity and its impact in their design. CoBeam2™is a trademark of All Sensors Corporation.